Happy Opening Day, friends. We will whet your appetite for Cardinals baseball with a couple hours of Mizzou Chat goodness. It's a quiet week around Columbia. Spring football is on spring break. Both hoops teams are shifting into offseason mode. Both diamond sports are doing well. Let's do this now. Quick arithmetic shows that Mike Anderson averaged 21 victories and 10 SEC wins in his eight seasons. That's not good enough in Fayetteville?!? Cuonzo Martin will have to go 12-6 just to get to .500 in the SEC by the end of his third season, and that's not likely with all the youth they've got. I was mildly surprised to see Arkansas fire Anderson, but it strikes me as a move where the AD is confident he's got someone else ready to take the job. Arkansas was never bad under Anderson - but never great. They're always competitive, but seemingly never close to being a consistent contender in the SEC. He's had some really talented players come through the program the last couple years between Bobby Portis and Daniel Gafford but never really capitalized with great seasons. I think Anderson is a good coach, runs a clean, solid program. You don't have to worry about NCAA issues with him. He's a stand-up guy who gets his players to play hard and has a defined system in place that can turn unheralded recruits into productive college players. But he seemed to hit a ceiling at Arkansas - and that program has proven to have the resources to succeed beyond that ceiling. I think he'll resurface somewhere, either at a struggling power conference school or one of the better mid-majors that loses a head coach to another job. Absolutely. They're RPI is No. 33 - and that will only go up if they can tread water in the SEC against all the elite programs they've yet to face. Remember, they made a regional last year when they finished LAST in the SEC and didn't even play in their own conference tournament. The Tigers are coming off two huge series wins over ranked Georgia and Kentucky. This team is the early surprise in the SEC. Follow-up: Softball can play in the post season as long as the NCAA appeal is pending, correct? Correct. As long as the appeals process is still ongoing, the sanctions are on a stay, which means they can't be enforced until the NCAA appeals committee makes its final ruling, which could take several more months. Sounds like Mizzou might be back in on Kobe Brown. Do you know much about where he could play? Kind of Looks like the wing and maybe a little bit of the power forward spot in a small ball situation? It would make sense for Brown and Mizzou to reconnect their lines of communication. He visited Mizzou before picking Texas A&M last fall. He's 6-7 but can play on the perimeter, averaged 8 assists to go along with 24 points as a senior. He might be a little undersized to play the 4/power forward in MU's offense before adding strength and bulk but could see minutes at multiple spots. I wouldn't rule out a return to Texas A&M if/when the Aggies hire Buzz Williams, a great coach who will be a natural fit in College Station. Brown is from Huntsville, Ala. Maybe new Crimson Tide coach Nate Oats makes a push to sign the state's top player. Mizzou figures to have some competition here if Martin's staff is serious about pursuing him. what is the latest on Mizzou basketball recruiting and do you think that Jontay may decide to stay one more year? I touched on Kobe Brown earlier. I don't really get into the weeds on hoops recruiting. I'll gladly write about the players once they arrive on campus, but the horse race coverage of recruiting doesn't really interest me. Martin's staff generally locks on to a small group of targets and quietly pursues them. They'll have one or two spots to fill. As for Porter, as I've written multiple times the last week or so, the expectation within the program hasn't changed. Martin didn't expect Porter back for next season before the most recent injury setback. Does the re-torn ACL change anything? Not really. The assumption is the same, that he'll enter the draft. There's not a lot of communication between Martin and the Porter camp. Porter wasn't an active member of the program this season, especially after the semester break in December/January. My sense is the team/program is ready to move on. Dave you may have addressed this already. What happens with Jontay Porter? Does he need to play another year of college ball to prove to the NBA that his knee is well? Or does he go to the G League for a year? Seems Cuonzo is in a tough position. Your thoughts. Thanks for the great job you do. I touched on this a lot Monday on the site. I'll post a link here shortly. Martin has expected Porter to enter the NBA draft. The decision is less clear now with the second injury but the assumption was the same as of this past weekend. Porter will get feedback from the NBA. If he was going to be a first-rounder coming off an ACL tear I suspect he could still slip into the second round coming off another tear. If not, I still don't see the logic in rehabbing the injury for a year as an unpaid college amateur, especially if he has nothing to do with his college program. I thought it was smart in his statement yesterday that Porter admitted this second injury was the result of going against doctor's orders. Now, it's not smart to play before being medically cleared. That's a sign of immaturity. He even used the word "naive" in his statement. But at least this sends a message to NBA teams that his knee isn't chronically damaged goods. His stock would take a bigger hit if the knee was repaired, he was cleared to play and then the knee gave out again. In this case, the breakdown was user error - not a defective product. Matter on Mizzou: What's next for Jontay Porter? stltoday.com: Another Porter injury leaves questions unanswered. Which football player is next on the NFL's radar? Baseball, softball surging. And a fond farewell to Sophie Cunningham. Hey, Dave ... The Drew Lock era had a lot of explosiveness on offense. I get the sense that the Kelly Bryant offense may not be as spectacular but should be more consistent and difficult to stop over the course of 60 minutes ... I think this O should be able to score at least 21/24 points against every opponent on its schedule with the possible exception of at Georgia, although I still think they can do it there. Do you see that? If that's the case, then Missouri's defense better make some big strides. MU gave up 28 points or more in seven of 13 games last year, so scoring 21-24 points per game isn't going to cut it. The worst offense in the SEC last year (Arkansas) averaged 21 points per game. The game has changed. If you're not scoring 30, you're not very good. MU averaged 36.6 points per game last year. I don't see the change in quarterback resulting that dramatic of a dropoff in scoring. This team will run the ball as well as anyone in the SEC if all parts stay healthy. Mizzou might have the SEC's best running back and the nation's best tight end. The receivers are better than average in this league and the O-line might be among the top three. Mizzou will score points as long as Bryant and the run game keeps the chains moving. Did I read it correctly that Drake Heismyer visited Michigan and Alabama before committing to Mizzou? Did he get offers from both schools ? If true this could mean in state recruits may take a longer look at MU before going far away to college. I’m sure Rountree and Badie are thrilled to have a big guy like him blocking for them. He does not have offers from Michigan or Alabama, just some interest at this point. Maybe that changes with some late offers, but he seems pretty set on playing for Mizzou. In the Gary Pinkel era, the idea that Mizzou, "was a family," seemed to be what attracted many of the recruits. Do you sense that HCBO is developing the same kind of atmosphere? Yes, but you also hear that from every program in the country. It's hardly unique. Odom has worked to get the right people in place to build a strong culture within the program. I see Sophie Cunningham was first team all SEC. Will WNBA teams draft her and is she good enough to play in the WNBA? Absolutely. There are only 12 teams in the WNBA, so there aren't as many jobs, but ESPN's latest mock draft has her as the first pick in the second round, going to Phoenix with the No. 13 pick overall. She'll be a very good player in that league and has the potential to be one of the league's best shooters once she gets acclimated. Can you give us a Reader's Digest version of what the Missouri football coaches look for, specifically, in a player? They've found several that other schools probably could have had but for some reason, didn't go after or at least not strongly enough. I'm thinking of players like Larry Rountree, Paul Adams, Kentrell Brothers, Cale Garrett. Sometimes (as with Chase Daniel) it seems to have been size/metrics but that's not the case with those other four (and many others). First off, Mizzou wants the best players in the country. Gary Pinkel would have gladly taken a recruiting class full of five-star prospects. Barry Odom, too. They offer the elite five-star players from Florida and Texas just like all the blue blood programs that have better success at signing them. But realistically, Missouri knows it can't sign those players, generally, unless they're in-state players who have a close proximity to the program. Pinkel had a very structured, defined evaluation system for recruits. He wanted to find guys with size and speed potential. If they weren't immensely productive high school players, that was OK if they had certain measurables where the staff could project they would turn into productive college players with the right kind of coaching and player development. The entire staff evaluated scouting reports on players before an offer was extended. In some cases the head coach could overrule the rest of the staff's decision. Pinkel has always said he overruled the staff on Charles Harris when the other coaches didn't think he checked all the boxes. He might be embellishing some there but it's fair to say not everyone was sold on Harris during the evaluation phase. As for Odom's staff, I'm not sure the process is that comprehensive. From what I understand the entire staff doesn't have to agree/vote on offers before they're extended to prospects. I obviously know more about Pinkel's process because of the book we wrote together. I've got binders full of material from his days at Mizzou on how they put prospects through the evaluation process. All of it was born out of Don James' system. Follow up question on basketball recruiting. Do you have an idea on what the staff in interested in mainly. Freshman guard? Freshman post? Grad transfer guard? Grad transfer post? Or a transfer that may have to sit a year? Not specifically. Martin and his staff are notoriously tight-lipped about recruiting. It was that way for him at Tennessee, too, when he had different staffers working for him. I'm sure they'd love to add another post player, but those guys are hard to find this time of year. Mizzou has been linked to some transfer guards, so they must be open to adding some backcourt help. Possibly, but as long as you're good enough to get into the NCAA Tournament, the rest is sort of a crapshoot. 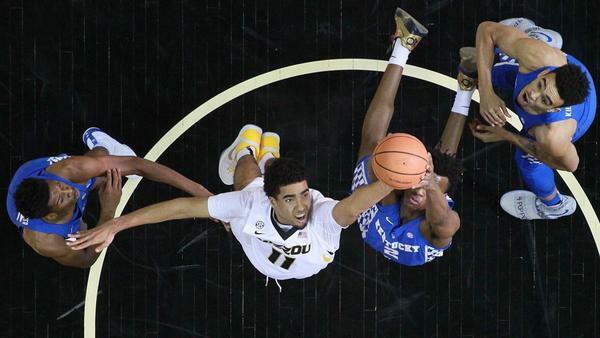 The "40 Minutes ... " was good enough to get Mizzou one step away from the Final Four. And that wasn't a fluke. He had really good college players that fit his system. I'm surprised he couldn't have more teams like that at Arkansas. He's had to rely on a lot of of transfer guards. That's a double-edged sword. You get guys who are older and more experienced but you don't get much time to develop them into three- or four-year players and it puts you in constant rebuild mode. I don't know if it's the system on the floor that's limited Anderson as much as his recruiting philosophy and track record. Turnovers were a big problem this season for MUBB. Pinson led the way with 70 with a really bad game against Auburn. Geist and Tilmon were right behind him with 69. Geist is gone and Tilmon has other issues to work on so who is going to be handling the ball next season. Keeping possession is critical especially in close home games like the LSU or TXAM games where MU had double digit leads in the second half that disappeared and resulted in losses. Geist's turnover rate went way down this year from last year even though his usage rate went way up, which means he had the ball in his hands a lot more as a senior and committed far fewer turnovers. Tilmon's turnovers were more about fouls than they were ball-handling. Pinson's issues were more about his passes than his ball-handling, thought he struggled with his dribble in that last Auburn game. If you look at turnover rate - which is far more accurate or informative than raw turnovers - the team's worst offenders, in order, were Santos, Pinson, Mitchell Smith, Nikko, Suggs, Tilmon, Puryear. Of the 11 players who were part of the regular rotation at one time or another, Geist had the third-lowest turnover rate. Only Mark Smith and Watson were better. But to answer your question, Dru Smith is the answer. He'll be a primary ball-handler next season. He's not a pure point guard or a pure shooting guard/wing, but he's a very sound handler who had an outstanding assist-to-turnover ratio at Evansville - and was a really efficient shooter. Pinson figures to see his role expand also, but he can play off the ball some. He was a far better 3-point shooter than MU expected at 40 percent. Only two freshmen who put up at least 50 3s has shot better in MU history: Brian Grawer and Kareem Rush. Yes, better than Denmon, English, Booker, Peeler, Gilbert, etc. Thanks for the chat Mr. NCAA. Why is Mizzou wasting money on Make It Right billboards in St. Louis (and presumably elsewhere)? The campaign is good and makes sense on social media. But billboards? I guarantee most people in St. Louis have no idea what those are in reference to. Seems like a waste of money for a department that is already strapped for cash. What you're telling me, Jon, is you didn't get a degree in advertising. Isn't the whole point of advertising to inform people of something they're not aren't aware of? I imagine countless people who don't know what Make it Right means have passed those signs and later looked it up and learned what the campaign is about. It's why politicians put up signs and billboards. It's why new companies do the the same. Missouri has a message that it wants to spread to its supporters and potentially new supporters. Happy opening day from KC. Long time reader, 1st time active participant. On the NCAA appeal topic. Do you see the committee dragging their feet to allow our football season to play out, and ultimately allow us to reach the post season? A little payback for a "bad call" without making a final decision? No. The folks on the appeals committee aren't concerned with that. Once MU issues its appeal and the NCAA responds, the timeline is essentially defined by their backlog of cases. The committees don't operate on a football team's schedule. They'll schedule the hearing once it's time for that, depending on any other cases that are ongoing, and then eventually settle on a ruling. Do you expect MU MBB to play more “four guard” or “positionless” style than this past season? Jontay's injury changed this past team's dynamic. They pretty much went with a point guard, two wings, a four (Puryear/Smith/Santos) and a five (Tilmon/Nikko) on every possession every game with a few exceptions. There were a few cases against Arkansas and some other opponents when he went with a four-guard lineup, but it wasn't that sustainable for long stretches without Mark Smith in the rotation. Next year's lineup should have some more flexibility. I can see some stretches where he can play Dru Smith, Mark Smith, Pinson, Watson and Tilmon on the floor together, surround the big man with four guards. Sub in Pickett for Watson or one of the Smiths. Yes. She'll be drafted for sure and will have a nice career in the WNBA - and make more money than the mayor of Columbia. I find it interesting that you observe that there isn’t a lot of communication between HCCM and the Porter camp, when the camp is sitting next to him on the bench. It's a unique situation. No doubt. Martin also knows that he signed up for this when he agreed to hire Porter Sr. as part of the package deal. Maybe it'll be the topic of my next book. Outlook seems good for next years mens BB. Tilmon has to make improvements. He is too tentative on offense and dribbles too much. Many of his fouls are with backing in. Needs Greg Church to come back and teach him how to use his pivot foot. He definitely needs to polish his game on the offensive end. I've heard some fans say he needs to get stronger, bulk up and get more physical in the post. I'm not sure those folks are watching the same games. Tilmon is as big and strong as any post player in the SEC. He's lean, but the dude is close to 260 pounds. Big men in this league - or any power league - aren't that big. He's a heavyweight. The problem is he uses that strength and bulk to a fault. He's too physical inside. The guy has really nimble feet and slick moves, but he too often he tries to bully his way to the basket and gets called for fouls. (He's got to get those arms and elbows under control, too.) After the final game, Tilmon confused me when he said he needs to bulk up because he can't get position in the paint. What? He's bigger than virtually every center in the league that he plays against - and stronger than most, I would imagine. It's more about positioning and using his finesse than just raw power. Tilmon is a monster compared to these guys. That's not to say he needs to avoid the weight room this year, but it's not a matter of just getting stronger. It's knowing how to use that strength.